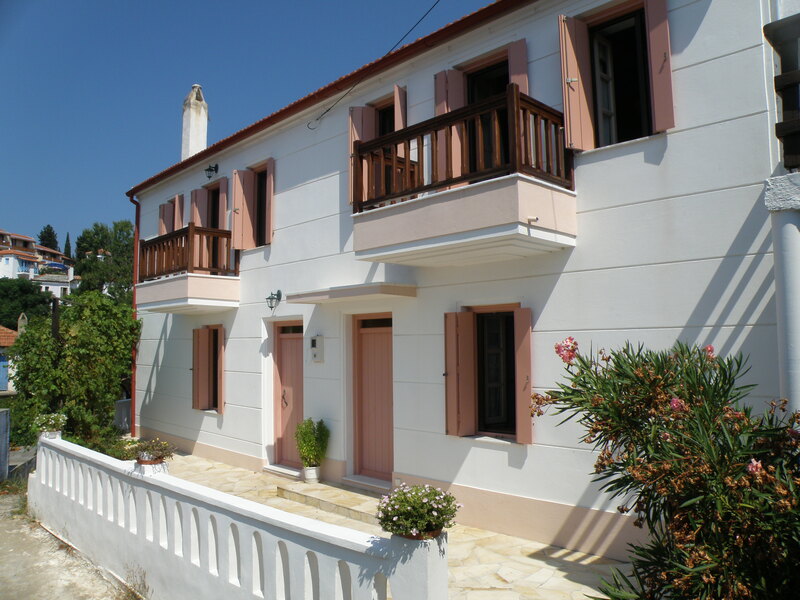 The house was built in Chora (Old Village) between 1905 and 1915 from our ancestor Nikos Demakis, who was a mason. He gave it to his daughter (and our great grand mother) Machi who was born in 1897 and was his youngest child. It was in this house that our grandmother Eleni (Helen) was born in 1920. In this house she lived after her marriage with grandfather Giorgos (George) in 1940 and gave birth to her two children, Elias (my father) and Machi (my aunt) between the years 1940 and 1950. This house was the center of financial and non financial activities of the family for the years to come and up until the end of the ‘60s. The two houses are typical examples of the way houses were built in Alonissos, a couple of centuries ago. Built with stone and timber, they both have two floors, each of which has a single large room. Green house was used by my grandparents as their home, whereas Brown house was used as a grocery store, run by them. The 9th of March 1965 is a milestone in Alonissos’s modern history. An earthquake of 6.1 on the Richter scale followed by another one of 5.7 two minutes later caused a great catastrophe in Alonissos and Skopelos. 561 buildings in Alonissos and 2.386 in Skopelos were damaged (on the total 1.941 were destroyed). After this great earthquake our family followed the internal immigration wave from the Old Village to Patitiri, which from then on has become the islands new capital. Ikia Vacation Houses welcome guests from April until November, each year. The Old Village, where Ikia Houses were built, can be accessed either by a 10 minute car drive, or by a 30 minute walk up the old donkey track from the port at Patitiri. During the summer a bus makes regular trips up and down the hill. It is about 200m far from the car park at the old threshing floors (Palia Alonia) at the entrance of the Old Village. It can not be accessed directly by car, as is the case with many traditional houses in the old village. The last 50m must be covered on foot. It consists of two independent and fully renovated two-floor houses, with a garden, that overlook Megalos Mourtias beach. The first house (Green) has a double bed bedroom with a fireplace on the ground floor, and a multipurpose room (with a double bed), a fully equipped kitchen, a bathroom with a shower and a small balcony on the first floor. The second house (Brown) has a ground floor multipurpose room with a fully equipped kitchen, a couch (converted into a double bed), a fireplace and a bathroom with a shower. Finally, the first floor has a bedroom that consists of a double and a single bed with a small balcony and a veranda. Each house can accommodate up to 5 persons. The houses operate as self serviced lodgings. They have fully equipped kitchens, hair dryer, iron, filter coffee machine, kettle, CD player with radio and Wi-Fi. The houses are equipped with Hunter ceiling fans. There is also a washing machine available upon request. Linen and towels are changed every five days. However, you will not find a TV. Our purpose is for you to relax as much as possible and enjoy the tranquility and the magnificent view from the balcony.